equal emphasis is made on the front and the back of head. Small as compared to the body size. The head is round as a marble and in many show birds it has the size of a small marble. Must present a grand arch, extending right from the base of the back skull to the end of the beak and bringing in the lower mandibles as part of this sweep. In this sweep there must be no corners, no bumps and no flatness. There needs to be a great width through the skull from eye to eye. The frontal must be broad, full and round, carrying right down to its junction with the wattle as much of the width between the eyes as possible. 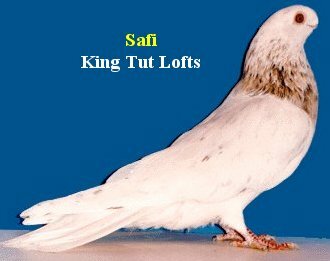 A well-developed beak is the highlight of a Safi. Short but thick beak. The under mandible is equal in strength to the upper and fitting tightly. Thus forming a blunt beak at the tip. Further a good beak is of no avail without good settings. It should be down faced and that is much assisted if the feather grows well of the very edge of the wattle where it joins the frontal. It is commonly said in Egypt that, "it grows from inside the head". it takes its place as part of the circle and must fill up any space between the frontal and the beak. It should be very smooth and occasionally bulging out from the profile. large and very wide eyes. Pearl color fading into a white lining circling a black pupil, in all light birds. Wine, red, gravel with inner white lining in darker birds. 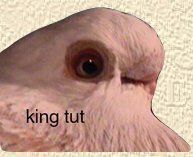 Bull eyes in recessive white birds. The cere is circular with fine and neat in texture showing no feathers. it complements the back portion of the head. It is moderately stout and short that blends in with a long back. The neck slightly arched and showing some dewlap in many birds. Short but strong, free from feathers below the hock. Toes are well spread apart. The average length should not be less than 30 cm (12 inches)from front of breast to tip of tail. Birds are slender and have fragile skeleton. The back is free from humps and the chest is devoid from frill markings. horizontal to upright station. Short legs. The shank forms an obtuse angle as it meets with the hock, thus showing the alertness of the bird. almond, grizzled, blue and whites are the most common. Color has lesser impact on the general evaluation of the bird. Any bird that doesnt show a rounded beak should be disqualified. Any bird showing a frill marks or less than 12 inches (30 cm).